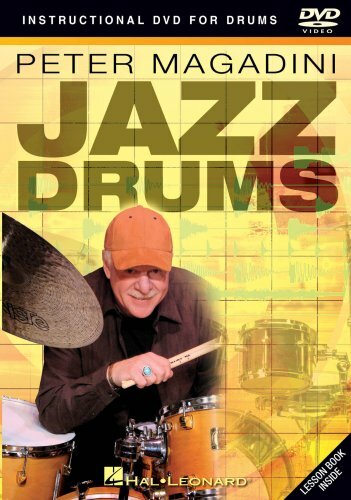 In this information-packed DVD, master jazz drummer and clinician Peter Magadini reveals the essential ingredients of jazz drumming. Inspirational live performances, concise explanations, demonstrations and exercises provide a comprehensive overview of traditional and contemporary jazz drumming styles and techniques, including: playing the jazz ride cymbal • playing with a “two” feel • the ride cymbal and independence • jazz form and structure • Latin and Latin jazz patterns, including Samba, Cascara and more • techniques for improvising on the drumset • playing fours and eights • how to trade solos with the band • brush technique • interpreting drum charts in all styles • jazz-rock fusion • and more. Includes a booklet with notated examples of the exercises and patterns on the DVD, with extra details of on-screen demonstrations.